Finding the right graphite shaft can be a time-consuming process. Choosing the right graphite golf shaft might be among the most complicated tasks you will undertake. The reason is simple -- there are more variables and options to choose from than you can shake a shaft at. Although it's possible to do it yourself, it could take you months if not years to find the best shaft. Yet, it's a crucial decision if you want to play your best. As "Golf Magazine" notes, "Choosing the right shaft is crucial to lowering your scores as well as giving you the feel and control you desire." 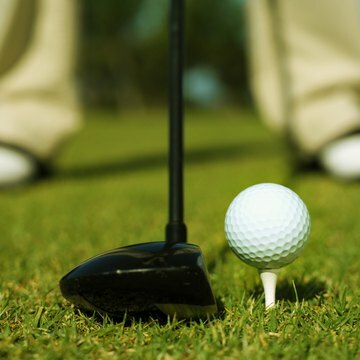 The articles goes on to state, "You can make the process easier by working with a qualified club fitter or professional." "Golf Tips Magazine" is even more blunt -- "leave the details to someone knowledgeable and simply get fitted by a professional club fitter." Locate an experienced club fitter. Club fitters often can be found at large golf shops, golf courses and large-scale golf ranges. You can ask club professionals to recommend a club fitter. Another option is to check out the Association of Golf Clubfitting Professionals, which lists club fitters by region. You also can consult "Golf Magazine," which published a list of its 100 top club fitters in America in 2010. Measure your swing speed. This is the first step toward finding the right graphite shaft. Your swing speed gives you and a club fitter a general idea of the best swing flex for you. If you swing the club slowly, you will need a shaft that bends more in order to maximize the distance you can hit the ball. For example, if your swing speed is less than 60 mph, you are likely to need a ladies flex shaft. Those who swing at more than 100 mph are likely to benefit most from an extra-stiff flex shaft, which allows better control of shots. Evaluate, with a club fitter, various factors that are crucial to determining the proper shaft. Among these factors are the weight and length of the shaft, the clubhead on the shaft and the kickpoint. The longer the shaft, the greater the potential to hit the ball farther, but the tradeoff might be less control. The lighter the shaft, the more clubhead speed you can generate, which can translate into greater distance but possibly less control. The lower the kickpoint -- the place on the shaft that bends the most -- the higher your ball flight will be. Test various shafts on a driving range while the club fitter observes. "Golf Magazine" states "it's all going to come down to how a shaft feels to you. Which means you need to experiment with different combinations of shafts and clubheads to come up with your ultimate prize."